Bobbing for apples is a traditional autumnal game enjoyed by people of all ages. It requires nothing more than a large tub of water, enough apples to cover the surface, and a group of people willing to get their faces soaking wet. 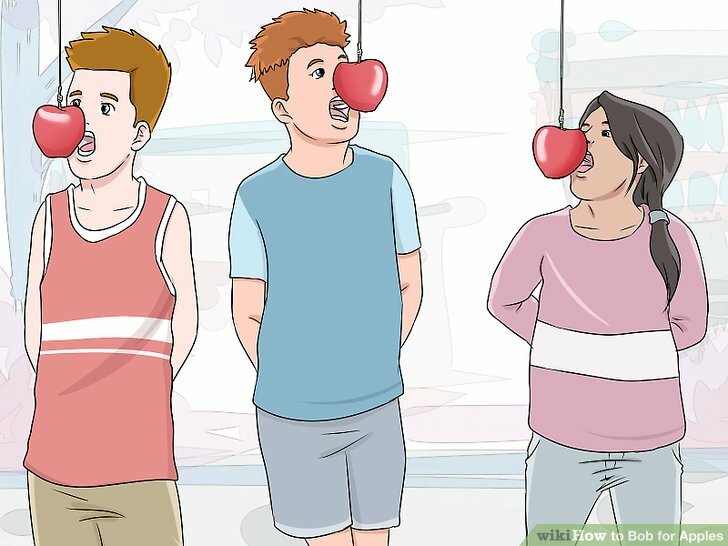 A variation of the game includes hanging apples from strings and attempting to catch them with your teeth as they swing and sway. Each game is a lot of fun to play, and they are great activities for your next Halloween party. Find a suitable tub. 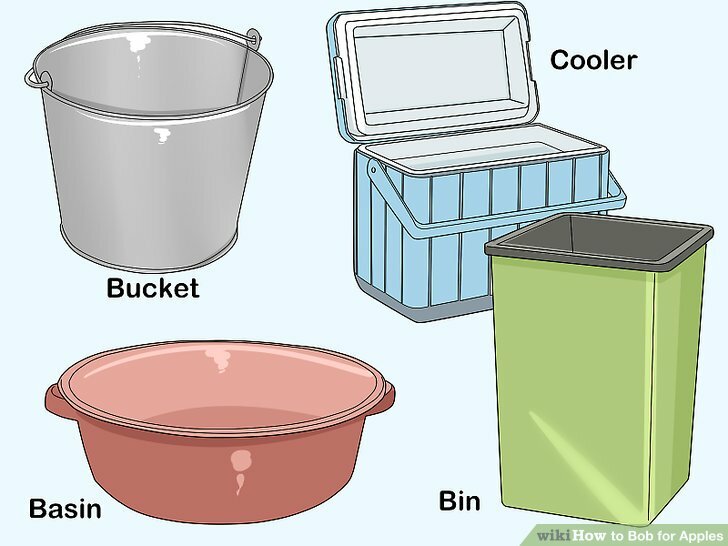 You can use a bucket, a cooler, a basin, or a bin, as long as it is big enough to hold water and apples. Wash the tub first, then place it on a table or cart that is strong enough to hold it when it is full of water. The top should be about waist-high to participants in the game. You could also place the tub on the ground and have participants kneel down to bob for apples. Fill the tub with cool water. You don’t want the water to be too cold or too hot because people will be sticking their heads in it. Fill the tub about 3/4 full. Take care not to overfill so that water won't be sloshing and splashing out—much. If you're playing inside, place towels underneath the tub and around the base so that the floor won't get wet. Float several apples in the water. Put as many as will fit in your tub, but not so many that the apples don't move: you want it to be a bit of a challenge. You can choose to put apples in for all the participants, or refill the tub as you go along. Another idea is to have the same number of apples (e.g., 5 apples) in the tub for each player’s turn. Choose smaller varieties of apples for children so it will be easier for them to sink their teeth into the apple. Plan on 1-2 apples per player, as some might get bites taken out of them but not removed from the tub with a player’s teeth. Select the order of players. 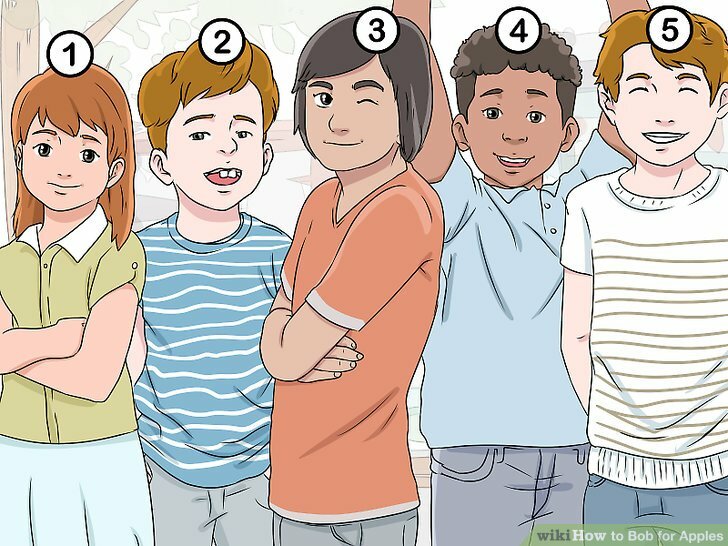 You could do this by age, such as allowing the youngest person to go first, or alphabetically, or choose a random order. 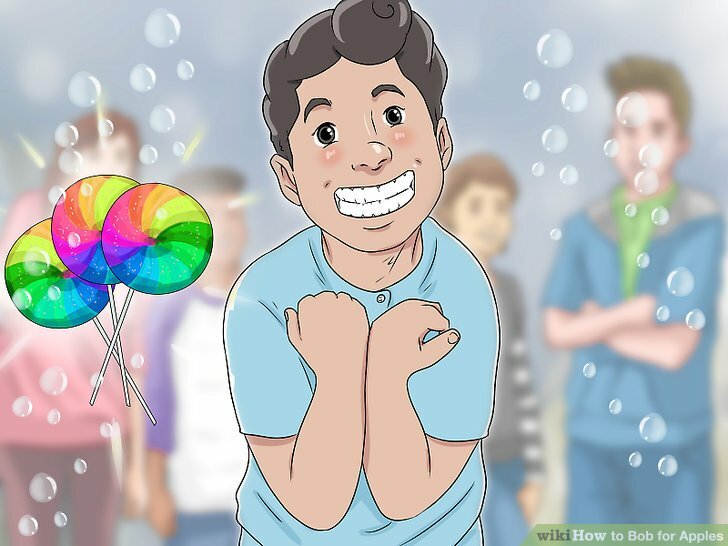 Alternatively, if you have a big enough tub, everyone can start at the same time and the first person to catch an apple in their teeth is the winner. Catch an apple with your teeth. Each player must try to grab an apple with only their teeth -- you can’t use your hands! Sink your teeth into the flesh, or try to catch the stem in your teeth. You must get the apple out of the tub using only your teeth, so if you drop it and it falls back into the tub you’ll have to try again. 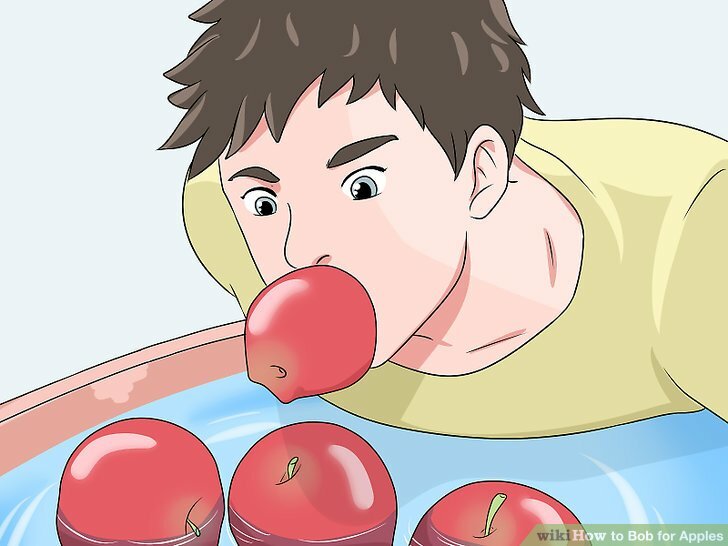 A trick is to hold your breath and push the apple all the way down to the bottom of the tub before attempting to bite it. The side can work too, but it is trickier! Keep your hands behind your back while bobbing. 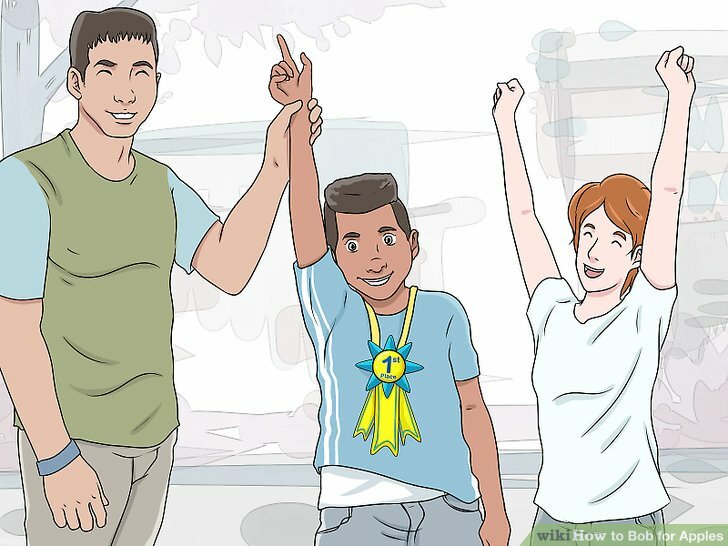 You are not allowed to use your hands for bobbing, so each player must keep their hands behind their back at all times. If a player touches the apple with their hands, their turn will not count and they must start over. Keep track of how long it takes each player to get their apple. To find out who can get their apple the quickest, time each player’s turn. You can have the other players count "1000 one, 1000 two," etc. while the player is bobbing. Or, use a stopwatch to keep track of how long it takes each player to get their apple. Set a time limit, such as 2 minutes, for each player. If you have time, players who didn’t get an apple on their first turn may go again. Select the winner. The person who catches an apple in the quickest time is the winner. You could hand out prizes like caramel apples, popcorn balls, candy, or ribbons. Clean up. Give a towel to each player so they can dry off. 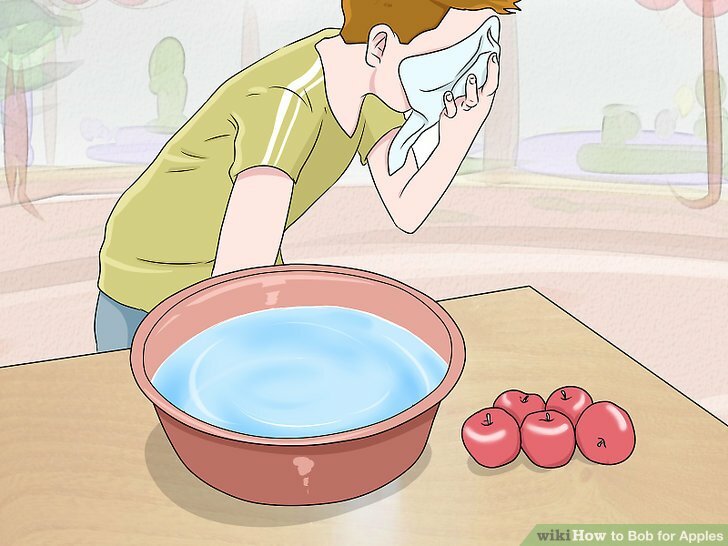 Remove any remaining apples and empty the tub of water. Tie string to apple stems. 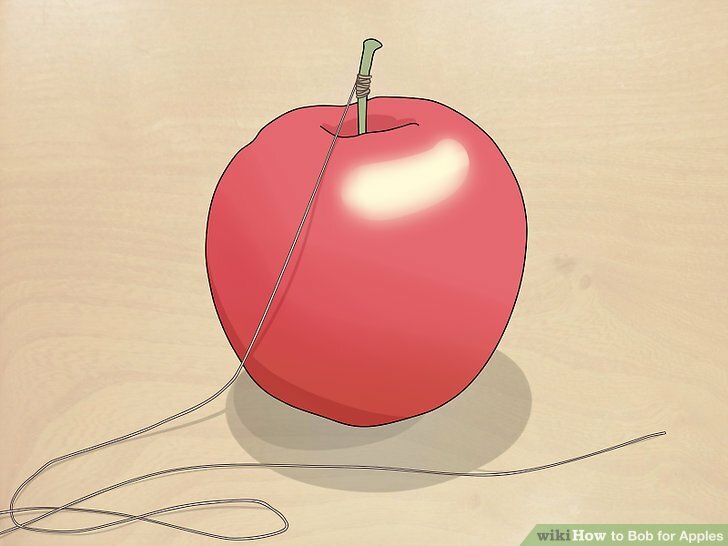 Select apples with long stems so that you are easily able to tie a string to the stem. Make a double knot and be sure the string is tied tightly. Vary the lengths of the strings. Each player should have an apple that rests at chin-height, so you may want to measure your players before hanging the apples. Hang the apples. You can hang the apples from a tree branch or a swing set. A clothesline may even work if it is high enough above the player’s heads. 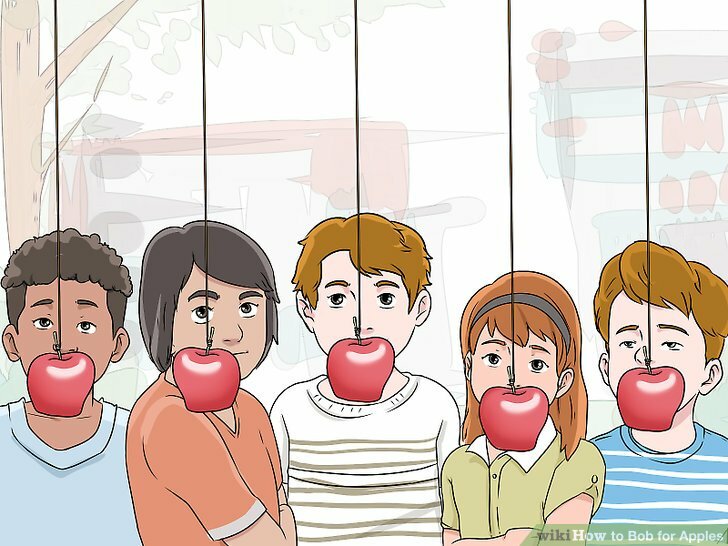 Hang the apples so they dangle in front of each player. Try to bite the apple. You cannot use your hands, so be sure each player keeps their hands behind their back. Attempt to bite the apple while it dangles on the string. This is harder than it seems, as the apple will swing around while you are attempting to nab it. Select a winner. The first person to grab the apple in their teeth is the winner. You could hand out prizes such as candy, bubbles, or chalk. Between players, remove bitten apples from the tub and replace them with fresh ones. You could ask each player to take out his or her bitten apple at the end of each round. Allow each player to eat the apple they tried to nab. 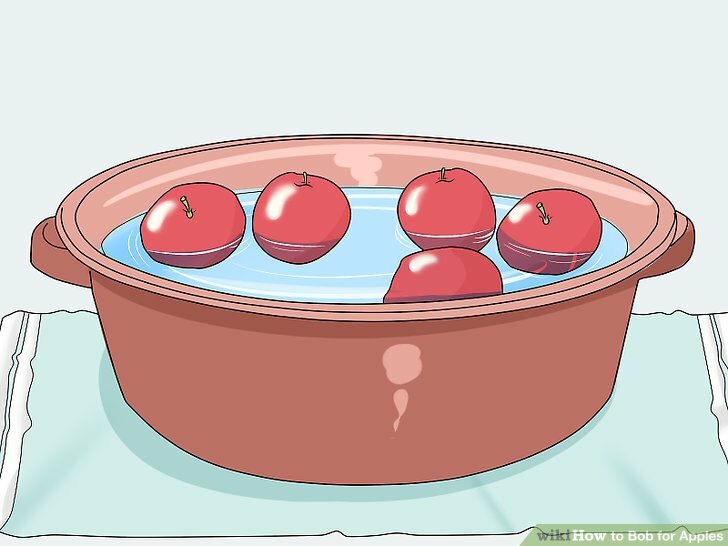 To make the game harder, take the stems off the apples before bobbing (when playing with water). If you want to vary the fruit, try other floating fruits, such as oranges, pears, or peaches. Do not allow sick people to play. Always supervise children bobbing for apples. Do not let a child stick his or her head under the water for a long period of time. If you have braces, you may not want to bob for apples. The front brackets could be torn off, or you could hurt your teeth. Germs can be passed from person to person through the water. Therefore, the tub of water that is full of apples is also full of germs! 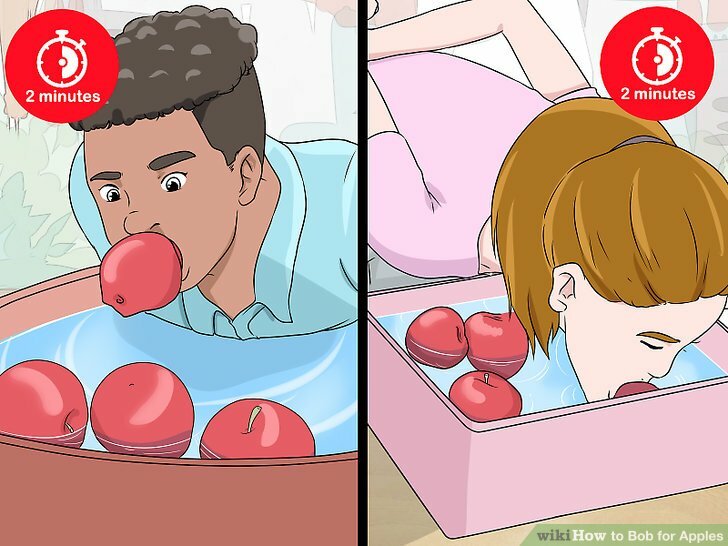 Keep in mind that bobbing for apples is a centuries-old pastime, so the likelihood of you getting very sick from playing the game is slim. Container such as a bucket, metallic tub, basin, etc.